Ok, so we let you start into the season nice and slow, but things are getting busy and so much to see! Which is probably a good thing looking out the window today …. goodbye summer, hello dance season! Although not technically dance, Australian company Gravity & Other Myths brings to us A Simple Space, October 13 – 24. Simultaneously raw, frantic, and delicate, seven skilled acrobats thumb their noses at the rules of gravity. In this dizzying collection of works in new circus, you become intimate with the stripped back stage where physical limits are pushed to the brink and the usual guards are broken down, exposing the reality of failure and weakness. Check their video out here. At the York Theatre, 1895 Venables Street, Vancouver 8pm. Tix. 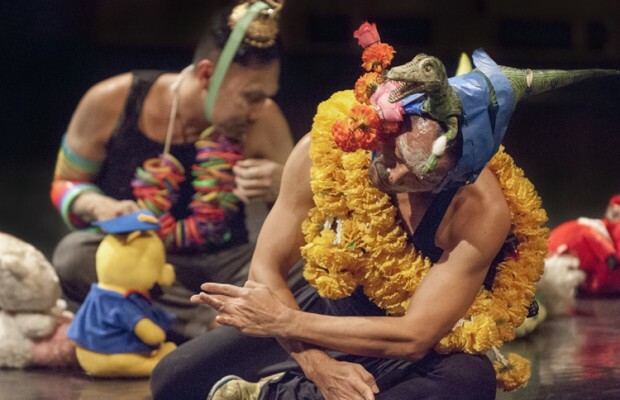 Next Friday and Saturday, October 16 & 17 The Interplay Project is a contemporary performance lab that celebrates innovation and experimentation in the performing arts. Curated by The Contingency Plan, the production provides an opportunity for artists to play, challenge and discover new ideas around collaboration and performance. The art of live performance will continue to surprise, provoke and engage the audience. Join in an evening of six diverse, multi-disciplinary artistic partnerships from emerging and established artists working in the realms of performance art, dance, music, spoken word, theatre and sound innovation. At the Moberly Arts and Culture Centre Studio Theatre, 7646 Prince Albert St, Vancouver. Tix $20 at the door, box office opens at 7, show at 8pm. ~ by DanceHouse on October 9, 2015.